Neuroscience is a top priority at UCLA. The Clinical Neuroscience Program at UCLA has consistently been ranked in the top programs in the nation. Clinicians and scientists in Neurosurgery, Neurology, Neuroradiology, Neuropathology, Psychiatry, and the Brain Research Institute work together toward the discovery and cure of diseases of the nervous system. The UCLA Department of Neurosurgery carries a continuing commitment to provide excellence in leadership in the major disciplines of neurosurgery. Neurosurgery Programs have been established in Brain Injury, Brain Tumors, Epilepsy Surgery, Neurovascular Surgery, Pediatric Neurosurgery, Spinal and Peripheral Nerve Surgery, and Stereotactic and Functional Neurosurgery. Other developing programs in Neurosurgery include Neuroendoscopy, Hydrocephalus, Interventional MR surgery, and Neurological Critical Care. The Ronald Reagan UCLA Medical Center Neurosurgical Training Program began in 1955 with Dr. W. Eugene Stern as the first chairman. Well regarded as an excellent clinical training program, UCLA helped pioneer the use of the operative microscope, cryothalamotomy, and embolization of intracranial aneurysms. With strong ancillary facilities, the University became an early leader in the surgical treatment of epilepsy and in the development of microvascular decompression for trigeminal neuralgia. The 1978 issue of Surgical Neurology by Dr. Paul Bucy listed UCLA in the top seven neurosurgical training programs (out of 92) in the country. This ranking was largely due to the strong diagnostic and teaching acumen of Dr. Stern, American Association of Neurological Surgeons President (1979-80) and the 1992 Cushing Medalist of the American Association of Neurological Surgeons. In 1985, Dr. Donald P. Becker became the Division Chief. Dr. Becker established a programmatic approach and recruited subspecialists from the United States and around the world. The faculty grew, as did the surgical caseload and residency training program. In addition to developing a highly academic and active clinical service, Dr. Becker also promoted a strong basic research foundation for the Division with the purpose of encouraging the training of academic neurosurgeons. Dr. Neil Martin took over the role as Chief in 2001 through 2016 and had the great responsibility of moving UCLA Neurosurgery forward into the 21st century. Unique opportunities were presented by burgeoning new technologies and biomedical advances. Dr. Martin was exceptionally qualified to seize these opportunities given his expertise in information technology applications to neurosurgical issues, coupled with his nearly 20 years experience at UCLA. Today the Department trains clinicians and basic scientists from around the globe. In addition to the formal residency program, research and clinical fellowships are offered in several subspecialties. There are currently more than five postdoctoral students completing studies in basic neurosciences as well as visiting scholars from Europe, Asia, and South America. The UCLA Department of Neurosurgery faculty includes 15 full-time academic clinicians; each with highly developed clinical subspecialization and focused research activities. Five Neurosurgery faculty were cited in the pacific region's most recent edition of "Best Doctors in America." Three neurosurgical Ph.D. investigators direct innovative grant-funded research and development programs. The educational programs of the Department of Neurosurgery are further supported by 20 dedicated clinical faculty members. 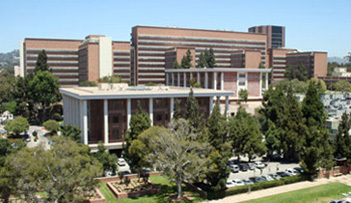 In 1999 the Division established a clinical facility at UCLA Santa Monica Medical Center. This expansion enables patients to obtain the expertise of UCLA Neurosurgery faculty while being treated in the comfort and convenience of a community hospital. Under the leadership of Chair, Linda Liau, MD, PhD, MBA the Department continues its pursuit in research, teaching and patient care. The residency program continues to recruit the top applicants from across the nation into its training program. In the research labs clinicians and scholars work together to unravel the mysteries of the brain as they seek to advance their understanding and develop new treatments for patients. The Department of Neurosurgery faculty actively participated in the design process for the new Ronald Reagan UCLA Medical Center, which opened on June 29th, 2008. The new hospital seeks to provide state-of-the-art patient care in a setting that is both pleasant and convenient for patients and their families.